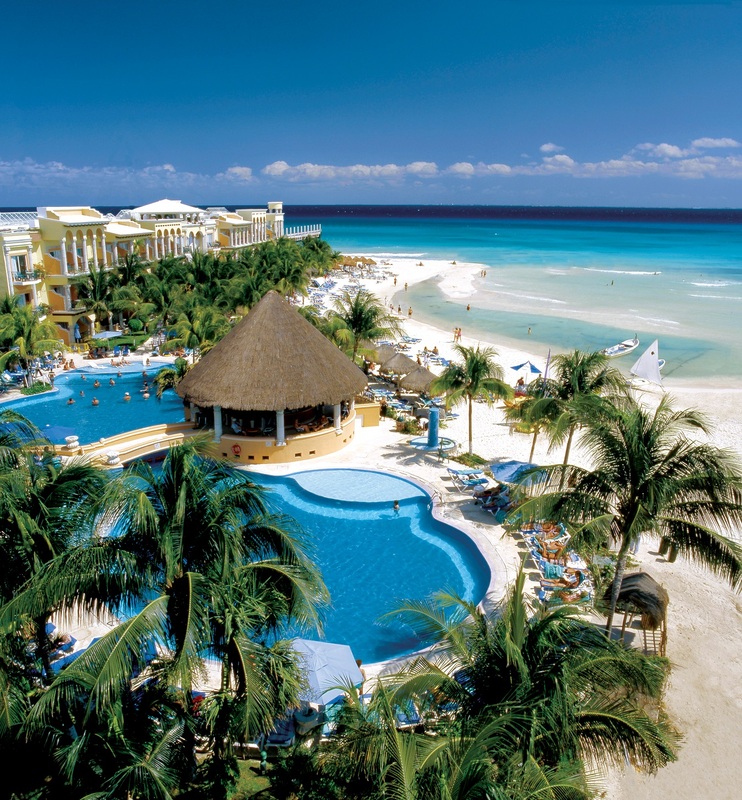 A luxury beachfront stay in the heart of Playa del Carmen awaits at Gran Porto resort. THIS HOTEL RECENTLY REBRANDED TO 'PANAMA JACKS' PLEASE SEE UPDATED WEBPAGE HERE. The unique location of this all-inclusive resort means that you can take a few steps out the door of your deluxe accommodations and you can find a spot in the sun on the beautiful beach, or you can stroll down the historic Playa del Carmen La Quinta Avenida (5th Avenue) and be surrounded by charming shops and restaurants. The Gran Porto has modern amenities including Wi-Fi throughout the resort, beach cabanas, a rooftop Jacuzzi and buildings with elevators. Quality service and 24-hour food, drink, and activities round out this amazing experience. There are 7 different room categories to choose from at Gran Porto. All of the 287 suites include a fridge stocked with soft drinks, air conditioning, a safety deposit box, a large flat screen television, a DVD/CD player, hair dryer, and coffeemaker. Choose to upgrade to a junior suite, a grand junior suite beachfront walkout or a family junior suite and you’ll find additional amenities in each room including, a private terrace or balcony, hammocks, bunk beds, and discounts at the spa and nearby golf course. Choose to savor the flavors at one of the eight different dining choices at Gran Porto. An international buffet is open for breakfast lunch and dinner, Mexican and Italian restaurants are open for dinner, and a number of grills, snack bars and a health and sushi bar are available for other meals. Too busy relaxing in your spacious room or don’t want to dress up for dinner? In-room dining is available from 7 a.m. to 11 p.m. or head over to the self-service 24-hour All-Inclusive Club which is stocked with snacks and beverages round-the-clock. Nourish the mind, body and soul at Spa Real. The journey begins upon arrival at the spa with a welcome glass of mint water, scented towel and a bathrobe and slippers help you relax prior to your treatment. Hot stone, deep tissue and relaxing massages can be enjoyed alone or as a couple. Choose a mud, paraffin or chocolate wrap, soothe a sunburn with an aloe treatment or reverse the hands of time with an anti-aging facial. Hair and nail services, waxing and much more are all also available. Casual, elegant or casually elegant, your ideal wedding can be had at Gran Porto. Wedding planners are on hand to take care of all the details and bring your vision to life. Contact us for more details. Cocktail receptions, banquet dinners, conventions and small meeting rooms are all available at Gran Porto Real. Whether your group size is 30 or 130, Gran Porto Real has the facilities and meeting spaces to accommodate you. Get in touch for our group rates. The Oki Kid’s Club, for ages 4-12, offers supervised activities to keep kids entertained. For the older set, ages 13-17, the T-Zone is a place to gather and make new friends while enjoying age-appropriate activities.